Graphenstone is a Spanish manufacturer of the ultimate technology in ecological coatings systems, unique in the market, and a game-changer of the green building concept. With lime and graphene as the main ingredients, Graphenstone is proud to announce that they are the only mineral paints in the world completely natural, 0% emissions and CO2 absorption. Their materials are the only ones with Cradle to Cradle GOLD certification, and they perform with the highest resistance, breathability, natural anti-bacteria, energy efficiency, excellent performance, amongst many other properties. The one day workshop will include a technical lecture by Graphenstone’s Technical Director, Patricia Silva an on-site demonstration by an experienced applicator, Fenando T. Viera and a hand-on wall repair exercise by participants. The workshop will cover deterioration of heritage walls in a tropical climate and a range of technical challenges commonly faced when conserving such structures (and solutions). Participants are encouraged to share related building issues faced in their property or project at the workshop. The hands-on wall repair exercise involves selected external wall surfaces of the Badan Warisan Malaysia building at No. 2 Jalan Stonor. The workshop is limited to 50 PAX ONLY and first come first serve basis. To register, please contact ICOMOS Malaysia secretariat at 03-2202 2866 or email to admin@icomos-malaysia.org. Interested participants are encouraged to check with ICOMOS Malaysia secretariat for the available seat remaining. This entry was posted in News & Events, Uncategorized and tagged conservation, Graphenstone, Heritage Conservation, ICOMOS Malaysia. Tan Sri Dato’ (Dr) Haji Mubin Sheppard is a name synonymous with the conservation and preservation of historical buildings in Malaysia. Born in Ireland in 1905, he arrived in Malaya in 1928 to serve for the Malayan Civil Service (MCS) until 1963. Tan Sri Mubin’s love for history and Malayan heritage is evident from his numerous publications, his involvement as Editor and President of MBRAS, Museum Director as well as the founding of the Malayan Historical Society in 1953. He was instrumental in the founding of Badan Warisan Malaysia in 1982 and championed the conservation and preservation of Malaysia’s built heritage. The Mubin Sheppard Memorial Prize was established by Badan Warisan Malaysia to raise awareness among younger members of society, about the built heritage of Malaysia. 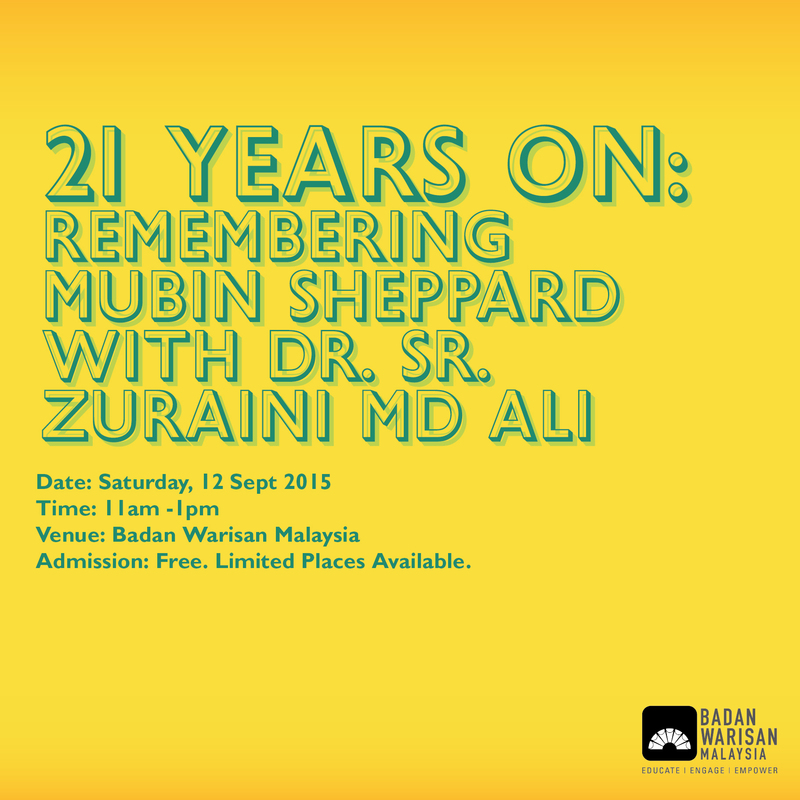 21 yers after his passing, Dr. Sr. Zuraini Ali celebrates his life and work and will share her insights on the tireless efforts and significant contributions of Tan Sri Mubin from the 1950s until his death on 11 Sept 1994. Dr. Sr. Zuraini Md Ali is a professional in architecture and heritage conservation in Malaysia. Her PhD entitled ‘British Colonial and Post-Colonial attitudes to Architecture and Heritage Conservation in Malaysia’ references many works of Tan Sri Dato’ (Dr) Haji Mubin Sheppard. She begin her professional career in Built Environment as an Assistant Architect and in the 1990s taught at Federal Institute of Technology, Kuala Lumpur and MARA Institute of Technology. Dr. Sr. Zuraini was among the pioneering staff who established the Department of Building Surveying, Faculty of Architecture, Planning & Surveying in UiTM and currently lectures at Universiti Malaya’s Department of Building Surveying, Faculty of Built Environment. As conservationist, Dr. Zuraini has worked on projects including the restoration of Dewan Tunku Canselor, University Malaya (2002-2004) and restoration of Taman Sejarah Kusta Negara (Phase 1) Sg Buloh (2012-2014). She has received several recognition and awards in her research and consultancy works including Honorable Mention in National Heritage Awards 2004: Conservation with Adaptive Re-Use of Bargas Zakariah, Badan Warisan Malaysia in 2005. This entry was posted in News & Events, Talks & Lectures and tagged 2 Jalan Stonor, Adaptive Re-Use, Architecture, Heritage Conservation, History, kuala lumpur, Mubin Sheppard, talk, walks & talks.